Beach: Private steps to private beach. 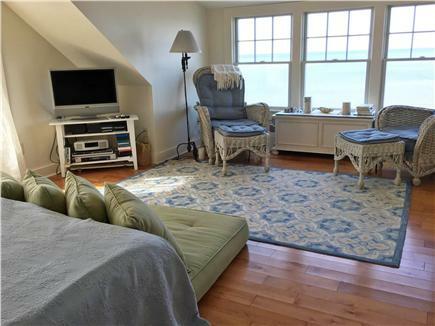 High on a bluff overlooking Cape Cod Bay, this summer oasis has sweeping views of the horizon and private steps to the beach. Relax on a large, private deck with outdoor lounge, have dinner on the side patio with a large table and gas grill, play lawn games in the private front yard, nap in secluded day bed in the flower garden, or start the day in a new outdoor shower. 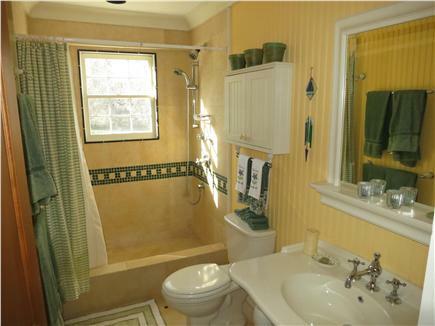 Inside, the house has a traditional cozy Cape cottage feel with luxurious modern bathrooms and a kitchen updated in 2010. 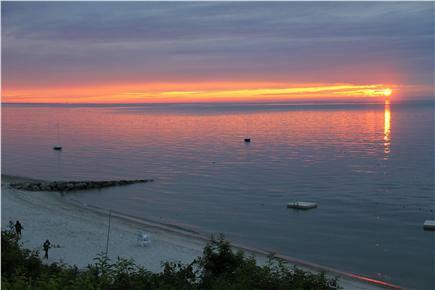 Its special beachfront location provides incredible views and spectacular sunsets. 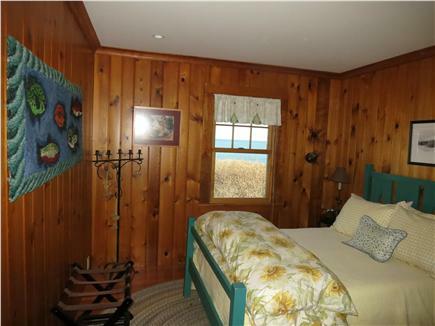 The five bedrooms (four with ocean views) provide room for extended family (1 king, 1 queen, one double, one two twins, and a bunk-room with 4 twins.) 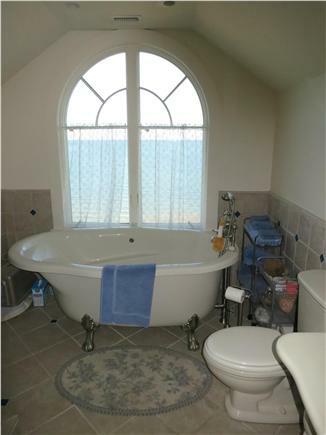 The three full bathrooms have been recently updated, including a clawfoot Jacuzzi tub in the master bathroom under an arch window overlooking the Bay. Wake to the sound of the ocean and a cool breeze; in the heat of the day, whole-house air-conditioning keeps everyone cool. The living room and dining rooms enjoy panoramic views of the bay through floor-to-ceiling picture windows, and feature an original fireplace and large dining table for entertaining. 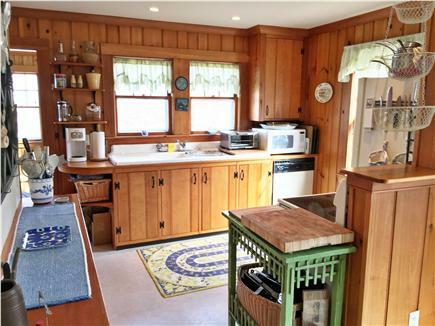 The rustic-cozy interiors provide Cape charm with modern conveniences. The kitchen is fully equipped with dishwasher, modern electric cooktop, a large and small oven, toaster oven, microwave, and refrigerator/freezer. An additional refrigerator is located in the basement den, a convenient place to store beverages for the beach. The walk-out basement includes a TV for the kids to unwind, gear for beach outings, and a modern washer and dryer. Located in a safe, gated community with organized activities for kids and adults, its the perfect place for family gatherings, special occasions, romantic getaways, or just a quiet week to recharge - a truly magical place for all. Nearest beach: Private steps to private beach. Additional pricing info: Discounted September rates. four day rates and weekly rates available. contact owner, State and local taxes of 14.45% will apply. We are so glad your families got to spend some time together! Thanks so much for coming to our home and we will hope to see you again in the future. 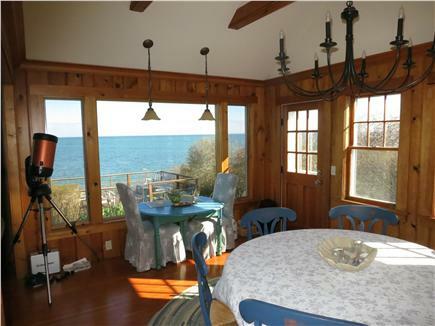 What an amazing home in Brewster! 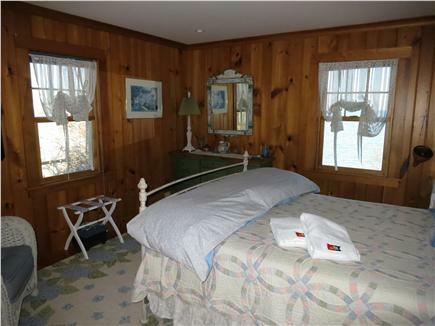 This was our 11th year renting a house on Cape Cod, and we have never stayed in a home that was so impeccably clean, full of every amenity, and room enough to spread out. We loved it. The owners are the nicest people you could encounter, and make sure that each guest has a lovely time. For cooking, everything is provided and works well. The bathrooms are all good-sized, clean, and have everything you need. For children, there are more than enough toys and books and even booster seat and plastic bowls, etc. We wanted for nothing. If you have a larger group, there are many places to sit and relax, or get outside and be by yourself. The large yard in front works great for outdoor activities. The deck was fantastic for just about every meal. 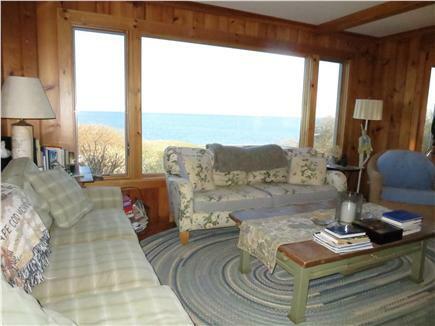 Or you could just watch the water and the sunset from right inside the house, the views are just so perfect. We have always spent one summer week in Brewster. Now that we have four grandchildren we needed a larger home. This lovely 5 bedroom, 3 bath home was perfect for our multigenerational family of 10. 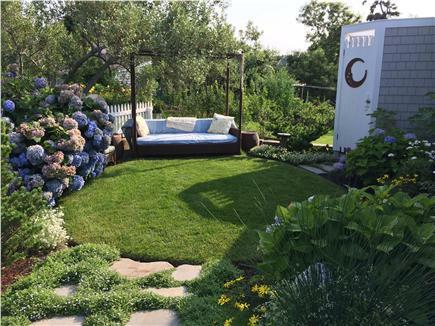 The beauty of the landscaping, the abundant Shasta daisies and hydrangea, and the views of Cape Cod Bay took our breath away each and every day. Our 2 three year old granddaughters enjoyed story time each morning and we all enjoyed the beautiful beach each afternoon. Everything needed for a fun vacation, including kayaks, was provided. We even enjoyed a few sets of tennis on the very nice courts. Once the children were in bed each night, we gathered for sunset dinners on the deck. Everyone was in agreement...we hope this will be our forever summer vacation home! We are so glad your family enjoyed our home and look forward to welcoming you back to Brewster! 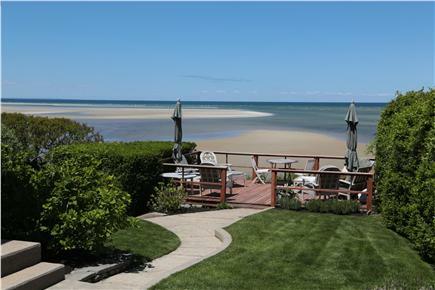 We have been renting houses on the Cape for several years, and this waterfront home is without a doubt the best we’ve encountered. I think, in general, the house is much more impressive than the website photos. We appreciated the personal tour that Paul and Kathy gave us when we arrived, as well as the detailed guide they provided us describing the house and neighborhood. The house, located high on a bluff, offered privacy and a spacious yard with plenty of room for playing. 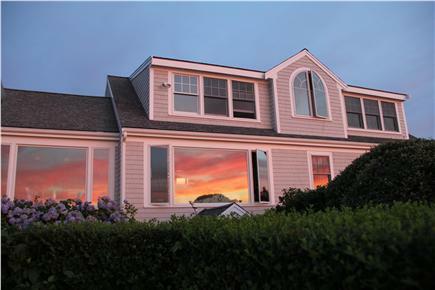 The landscaping was meticulous, and the view of the bay, including many vivid sunsets, was breathtaking. Our three-generation group had plenty of room for sleeping, eating, and living. The gals liked the well-equipped kitchen, and the guys enjoyed the 6-burner gas grill. The wood deck at the edge of the bluff was a great gathering place for everyone. We enjoyed eating lunch there, talking, or just appreciating the view. The beach, of course, is a highlight of any visit to Cape Cod, and this one did not disappoint us. We enjoyed swimming, kayaking, jumping off the docks, playing in the sand, and much more. At low tide, the enlarged beach area allowed us to explore far out from the high tide shore line. The grandkids made many new friends at the playground (a short walk away) and the beach. The neighborhood has a wonderful friendly atmosphere. We hope to vacation here again in the future. Thank you for the awesome review! We are so glad you enjoyed your stay and appreciated the unique nature of our home. You were awesome guests and we hope you will consider us if your plans bring you back to the cape! We recently had a three generation family trip at this wonderful house. It was everything we expected and more. It's even better than the pictures! The view is breathtaking, and it is clearly a well loved home...not just a house. We could not find one single thing wrong! Perfection! 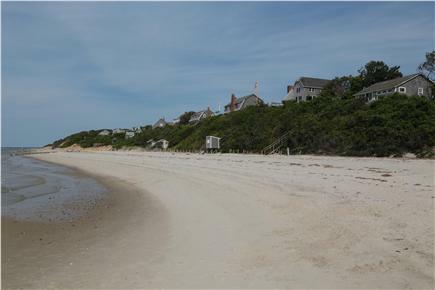 It's located on one of the most beautiful beaches on the Cape. We are a family that likes to cook, and we found the kitchen very well-equipped and an herb garden we were told to help ourselves to. Paul met us and gave us a great tour of the home before leaving, and Kathy was easily reachable before, during and after our stay for any questions. 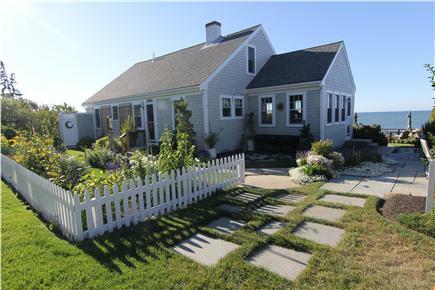 We would highly recommend this home for your Cape Cod escape! Thanks, Wendy, and the whole family! It was a pleasure to share our home with you, and we are delighted you had such a wonderful visit. You treated the property with care and respect and we would welcome renting to your family in the future!